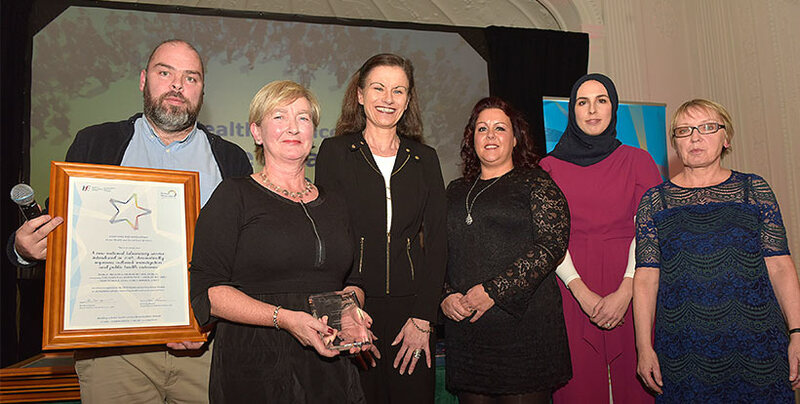 Mr. Ronan Waters, Administration PHL, Dr. Eleanor McNamara, Director/Consultant Microbiologist PHL, Dr. Geraldine Smith, HSE who presented the award, Dr. Anne Carroll Specialist Molecular Medical Scientist, PHL, Ms Naima Filali Medical Scientist, PHL and Ms. Mary Linehan Chief Medical Scientist,PHL. A new national Laboratory Service, introduced in 2018 has dramatically improved outbreak investigation and public health outcomes, according to the HSE. It said new cutting edge technology introduced in 2018 into the VTEC reference laboratory at the Public Health Laboratory (PHL), Cherry Orchard Hospital, Dublin had significantly improved its capacity to identify potential disease outbreaks and resulted in substantial cost savings. Dr. Eleanor McNamara, Director of the Public Health Laboratory, Consultant Medical Microbiologist. at St James’s Hospital, Dublin and Lecturer at Trinity College. received a HSE Excellence Award for Innovation in Service Delivery for introducing the new service. She said the award was accepted on the basis of the teamwork by all of the staff in the PHL, HSE, Dublin –based at Cherry Orchard hosp. In particular under the supervision of Dr. Anne Carroll (Specialist Molecular Medical Scientist- PHL ) and Ms. Mary Linehan (Chief Medical Scientist –PHL). Verotoxigenic E. coli (VTEC) is a bacteria that can cause potentially life threatening illness. It is transmitted through contaminated food or water, contact with infected animals, from contaminated environments or from person to person. The PHL introduced whole genome sequencing (WGS) to its National Reference Laboratory (NRL) service to protect the public from illness caused by VTEC. WGS improves outbreak investigation which contributes significantly to risk reduction strategies for this pathogen by facilitating early detection of potential outbreaks, and allowing faster public health interventions. In 2018 this service was used for the characterisation of strains from more than 700 VTEC cases, and in the investigation of more than 280 potential VTEC outbreaks. In 2017, all human VTEC isolates were sent to Public Health England for sequencing at a cost of €255,200 with a turnaround time of greater than 21 days. Dr. McNamara said “Performing WGS at NRL-VTEC in 2018 cost €85,000, saving €170,200 with a shorter turnaround time of ten days. Rapid public health actions protect consumers from foodborne illness resulting in improved patient outcomes. “This use of this novel technology has provided Ireland with public health microbiology capabilities comparable to the USA and other major European countries and allows Ireland to fulfil its obligations to the EU strategy of strengthening VTEC public health management capabilities. “This new quality assured WGS enhanced VTEC reference service was prompted by the need to devise a public health microbiology initiative that contributes to managing and reducing the disease burden associated with severe VTEC infection. WGS can be used for investigation of infections in both acute care and community settings. WGS data was shared rapidly with multidisciplinary outbreak control teams including colleagues in Public Health Departments, the Environmental Health Service (EHS), the Health Protection Surveillance Centre, and often the Food Safety Authority of Ireland, the Department of Agriculture, Food and the Marine investigating VTEC food/water borne incidents in a ‘one health’ approach. 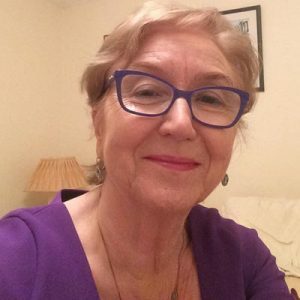 Dr. McNamara is the current Irish National Focal Point for Microbiology at ECDC (European Centre for Disease prevention and Control) and is the Main Irish Supervisor for the 2 year ECDC European Fellowship in Public Health Microbiology – ‘EUPHEM’. She is a member of the ECDC Food and Waterborne Diseases Network. She has published and presented internationally on Public Health Microbiology and Health Care Associated Infections.